Aside from reaffirming your love or celebrating a new one, doing everything you wish you would have done the first time around is what it’s all about! Which is why wedding day details are such an exciting part of a second wedding or vow renewal ceremony. It’s so exciting planning for the second time because you are a pro! You know what’s important and what isn’t and you have a new found style and second chance glow to show off to your loved ones! So, once you have your dress, your flowers, and everything else leading up the the big day – it’s time to focus on the wedding day details you don’t want to skip! Wedding day details are essential, right? The flow of the ceremony, the coordination of the vendors at the reception, and the decorations your guests will see… all of these are pieces of a puzzle that will come together and wedding day stationery can make that happen! We are talking wedding programs, menu cards, place cards, and guest books. Basic Invite has given us some of their favorite tips and tricks on how to utilize wedding day stationery details to make your day one to remember! Wedding programs can be used for so many things! There main purpose is to help the flow of the day go smoothly, but if you’re smart they can serve as much more than that! Especially for larger weddings where guests may not know one another programs can serve as reading material and talking points while everyone gets settled. If your ceremony is more formal and lengthy programs can help keep guests on track so they can pay attention to the events as they unfold. Designate a couple family members or close friends to stand as greeters and have them hand each guest or couple a wedding program as they come in. It will help start everything off on the right foot! One of Basic Invite’s favorite wedding day details… place cards! Place cards are such a nice thing to incorporate into the reception. 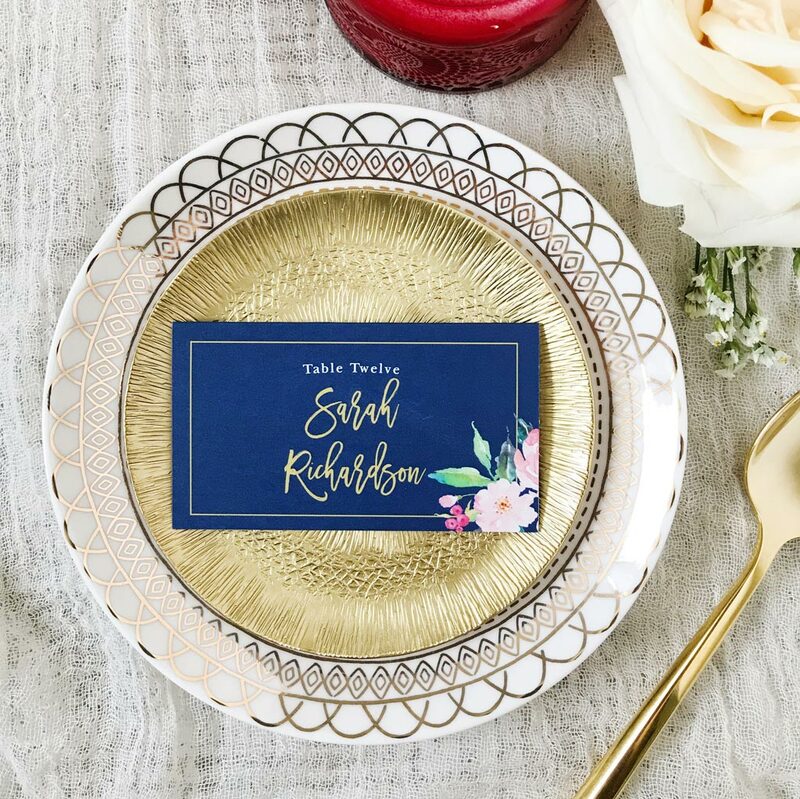 Whether you place all the cards at a table for guests to grab as they walk in or set them up at each place setting prior to guest’s arrival, these little pieces of stationery will make your guests feel extra special. If you’re looking for a decoration to bring your table scape together, a personalised name card can be the perfect final touch. Choose a design that matches your wedding theme or keep them simple by choosing a classic border design with foil. The options are endless and this detail won’t go unnoticed. Last but certainly not least – menus. You can get seriously creative with menu cards. Design a larger sized menu with all of the options laid out or be subtle with a dessert and drinks only menu. Place the menus atop each place setting or in the middle of every table to add to the decor and inform your guests on the night’s bites. Day of details are essential and can be catered to every couple’s needs. Thanks to Basic Invite we have the lowdown on wedding day stationery and a place to get all of it. Basic Invite has endless customization options with over 180 colors and 100 font choices. You can match your day of designs to the invitation you’ve already sent out or choose a new look entirely! They also carry wedding save the date postcards and so much more!